At Abilene Family Dentistry, we love learning new things and passing on knowledge. However, some of the best practices for a healthy mouth happen to be tried-and-true instead of new. What’s relatively newer is the understanding of the oral-systemic link and how integral your oral health is for overall wellness, as well as the technology that helps us identify problems before they cause damage that requires more invasive treatment. We’re happy to see you regularly, and even happier when we can give you good news, so don’t skip your check-ups and cleanings! Schedule a check-up with us today! Although a fresh looking and smelling smile are important benefits of a solid oral hygiene routine, there’s an even more compelling reason to be diligent in your habits! When you floss and brush properly, you’re making your mouth less hospitable for bad bacteria—bacteria that’s been linked to heart disease, stroke, diabetes, and many more ailments we know you’d rather avoid. To decrease the amount of food debris and plaque (which hardens to tartar, and tartar requires a professional cleaning for removal) in your mouth, make sure to take the following steps each day! Use a soft-bristled toothbrush and be sure to replace it at least every 3 months. Brush in small, circular movements for two minutes at least twice a day. Don’t skip your tongue. Wait at least 30 minutes after brushing before eating or drinking. This prevents enamel-eroding acid attacks. Floss once a day. Curve floss around each tooth in a c-shape and slide it slowly back and forth, not up and down. Use a new section of floss between each tooth to avoid redepositing plaque and bacteria. Optional: rinse with an alcohol-free mouthwash. Alcohol is drying, and you don’t want to inhibit your production of saliva. When toothbrush & floss aren’t available, swish and spit with water. This helps reduce plaque and acid buildup throughout the day. Gum disease, also known as gingivitis (the reversible stage) and periodontitis (the advanced stage), is the leading cause of adult tooth loss. It’s a very common infection and can rapidly wreck havoc on your smile. As if that’s not bad enough, the bacteria that cause gum disease can cause inflammation in other parts of your body, resulting in serious conditions such as heart disease, stroke, diabetes, rheumatoid arthritis, pregnancy complications, and some cancers. Ongoing research is discovering more of these oral-systemic links all the time. The good news is that gum disease is preventable. Your thorough oral hygiene routine and regular preventive examinations will be your best defense. 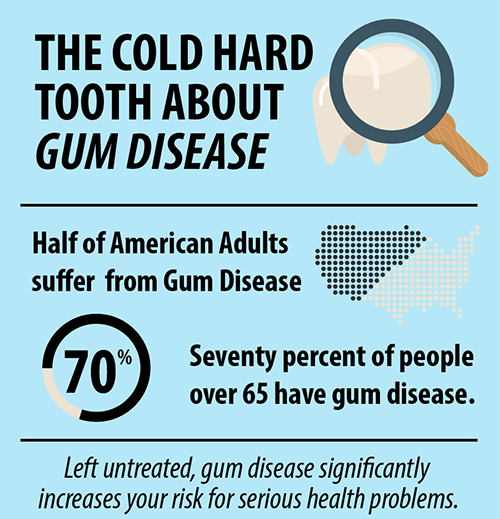 If you do have gum disease, we can help with non-surgical treatment to optimize both your oral and your overall health. Our thorough examinations include screening for oral cancer. Your risk may be low, but we make note and inform you of anything that seems abnormal, because the rates of oral cancer in America are on the rise. 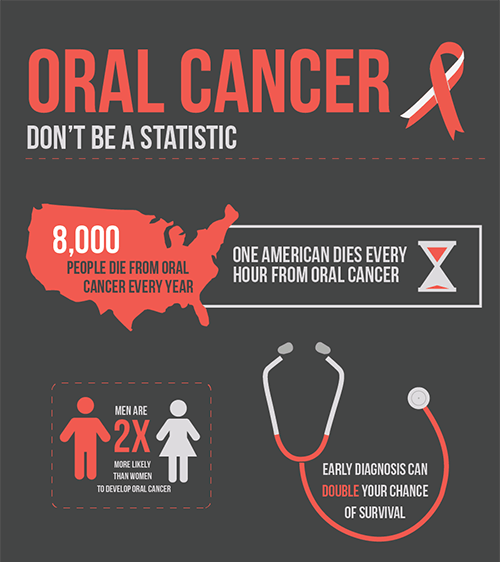 In fact, oral cancer is responsible for over 9,750 deaths per year, which means one person per hour dies of the disease. Perhaps the main reason it’s such a deadly form of cancer is because it’s caught in later stages, so we want to spread awareness about what increases your risk and what to be on the lookout for. If you notice any of the signs and symptoms listed on our graphic, we highly encourage scheduling a screening. Keep in mind that 25% of patients diagnosed with oral cancer don’t have any of the risk factors, so regular examinations with our intraoral cameras can provide you with peace of mind. If you or your child play contact sports (whether you’re coming into contact with other people or equipment), we strongly suggest wearing a mouthguard to protect your smile. Besides protecting your teeth from being cracked or knocked loose, they can keep your teeth from cutting into your tongue, cheeks, and lips, too. You can find stock boil and bite mouthguards at sporting goods stores or even some drugstores, but these varieties are often less comfortable and durable. We’re happy to customize strong mouthguards to precisely fit your mouth and provide the most protection. If you’re a chronic jaw clencher (jaw clenching is also referred to as bruxism) or teeth grinder, which may happen more while you’re asleep, you could benefit from wearing a nightguard. 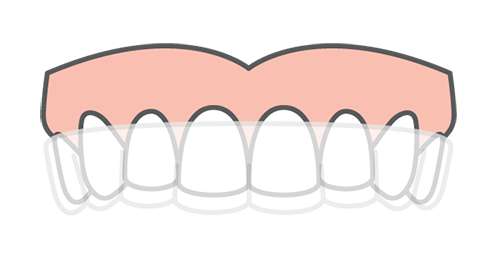 These habits cause excessive wear to the teeth, creating the need for bonding or in more extreme cases, crowns. Besides the damage done to your teeth, the pressure on your temporomandibular joint, or TMJ, can cause a lot of inflammation and pain. Protect yourself from TMJ-related headaches and migraines, ear-ringing, and facial muscle soreness by wearing a comfortable nightguard tailored to your unique bite! If you have any questions about general dentistry or you’re ready to schedule a consultation with your Abilene general dentists, Dr. Webb and Dr. Awtrey, give us a call today or request an appointment online. We look forward to helping you strengthen your prevention methods!